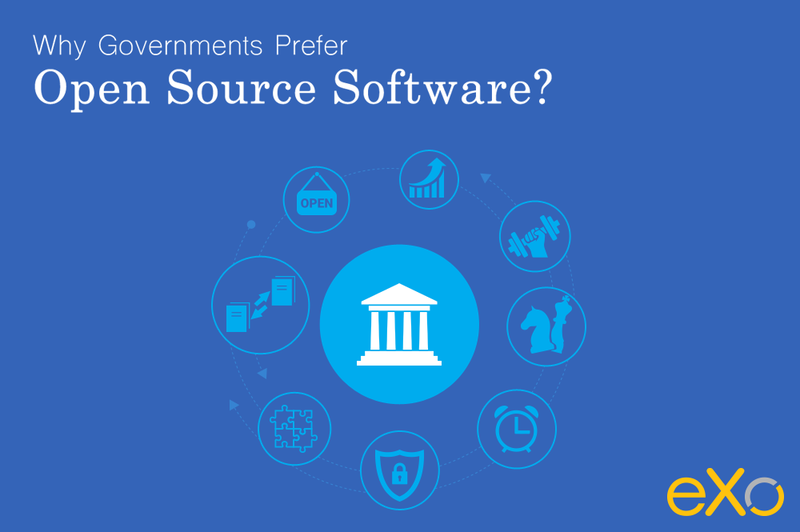 Why Do Governments Favor Open Source Software? Since its birth more than 20 years ago, the open source movement has continued to gain momentum in corporate computing. But it hasn’t been until recently that it has entered the government sphere. In France, the UK, the US and even the EU, governments have recommended using open-source software in their administrations. Beyond them, the phenomenon has become truly global–for example, a 2010 report identifies more than 300 government open-source policy initiatives. What drives so many governments to favor adopting open-source software within their administrations? After taking a closer look at this issue, we realized that the benefits of open source are particularly well aligned with the objectives pursued by any government. We describe several prominent benefits here. One of the major concerns of many governments is maintaining control over their IT spending at a time when the digital transformation of government operations has become an imperative for everyone. Although open-source software is a commercial product and therefore not free of charge, it has a total cost of ownership that is generally lower than proprietary software. Using it therefore helps public bodies better contain their IT expenditures. Indeed, when governments need to acquire and/or develop customizations, the competition for this service is totally open. In contrast, suppliers of proprietary solutions often limit such services to a few certified partners. As for training, open-source software has an advantage because of its wide availability to users. Of even greater importance is that skilled technicians and developers can learn the software’s inner workings relatively quickly because its code is readily available. This greatly facilitates maintenance because, even when software is no longer officially supported, it is always possible to diagnose, debug, and correct the open code. Finally, governments can control the cost of migrating from an existing system to open-source software by implementing progressive migration strategies. This is made possible by the developers ability to adapt the code as needed to temporarily accommodate the transition process while reducing service disruptions. Any public procurement generally requires competitive tendering. Due to its nature, open-source software allows anyone to make a bid. With proprietary software, only the creator and/or vendor of the software can respond. For open-source software vendors, the high level of competition demands ongoing excellence if they are to compete successfully on procurement offers. A proprietary software firm, on the other hand, can lock in its presence by ensuring that only it can meet the tender’s requirements. This competition also produces a significant cost benefit since bidders vie for the work based on experience and expertise and on price. The latter characteristic helps governments make the best use of taxpayer money. The bidding process also improves the quality of IT resources available to governments because, to win bids, competitors have to develop innovative, top-notch proposals tailored to fit the needs of the public entities that award contracts. Public-sector investments, particularly spending on IT resources, are meant to be long term and are planned over several years. Open-source software fits this practice well because it reduces a government’s reliance on a single vendor. Whatever happens, even if the initial solution provider fails to complete an implementation or no longer supports its product, governments retain the right to use and modify the open-source software. Any administration that finds itself in this situation can easily and quickly turn to a new service provider to take over its IT maintenance and development. Government agencies are entrusted with a wide variety of public-service tasks and must perform these tasks in compliance with regulations. This responsibility extends to their computer systems, and the challenges of ensuring the regulatory compliance of their IT assets across multiple agencies can be complex and onerous. With open-source software, however, government agencies can “mutualize,” that is, coordinate and share, the development and implementation of their IT solutions in a manner that ensures an across-the-board satisfaction of all requirements. Pooling their means in this manner also allows them to maximize efficiency for these projects. This advantage is what prompts many federal, state, and local government authorities and administrations to be active in open-source communities. In addition, companies that market open-source solution, support, and maintenance services generally do not impose limits on the number of users. This allows governments to carry out joint implementations without worrying about constraints on user volumes. Among the most avid users of open-source software are ministries of defense. Naturally, these have an absolute requirement with regard to computer security and data confidentiality. For this reason, open-source software is their obvious choice because the open code allows for complete audits to check for backdoors or other vulnerabilities. The fact that proprietary software hides the source code does not make it immune to attacks. Indeed, even though the source code is not public, it is generally possible to reconstruct it using disassembly and decompilation techniques. When vulnerabilities in proprietary code are exploited by attackers, detecting, identifying, and defeating the attacks quickly can be extremely difficult, if not impossible, because of the lack of access to source code. Conversely, open-source code accessibility, as well as the freedom to copy and modify it freely, allows one to react quickly when vulnerabilities are discovered. One no longer has to rely on a proprietary vendor’s security policy. This characteristic gives government entities complete control of their IT systems and helps them better ensure that critical functions are protected in terms of security and privacy. In addition, by having the control over their IT assets that open-source software makes possible, governments can be mostly independent from private-sector vendors and thus retain more sovereignty over their computer systems. Government administrations have to serve millions of citizens and so need to have complete trust in the robustness and reliability of their IT systems. With open-source software, they can easily monitor their computer systems’ functionality, correct the code when necessary, and even improve it as needed. Something else that governments can benefit from is the fact that it is increasingly easy today to make contributions to open-source projects thanks to user-friendly software platforms such as GitHub that implement collaborative workspaces around code repositories. This openness facilitates the ongoing accumulation of skills and knowledge. The code work of everyone is visible to all and creates a friendly competition where hordes of passionate developers compete with creativity and rigor to enhance and expand the source code and gain the recognition of their peers. All users benefit from these continuing contributions, including governments. Increasingly, citizens demand transparency regarding the actions of the public figures and the public agencies that spend their taxes. This demand has prompted a blooming of new “Open” concepts–Open Data, Open Education, Open Law, Open Government, etc.–that are redefining government operating standards. Such initiatives are made possible by technological advances and have been largely inspired by the values and practices of the open-source community, which are based on sharing and adding to the common good. The transparency mentioned above is an increasingly strong citizen requirement in modern democracies. Not only must public actions be held accountable, but governments must ensure that the people have digital access to stay current with and monitor the actions of the public entities that serve them. As with private-sector company IT systems, public-sector information systems suffer from a heterogeneity that can greatly hamper the functioning of public service. Using open-source software, which is based on open standards that facilitate data transfer, makes it easier to achieve IT homogeneity, and thus increase compatibility, across agencies by combining or adapting systems in ways that improve data access and transfer. For a public-sector organization, using open-standard open-source software in this way allows data to be transferred as smoothly as possible, which makes the data more useful and at the same time enables agencies to be creative in developing and offering more innovative services to citizens. Public bodies must not forget that their actions should first and foremost be guided by the value they deliver to citizens. Often mocked for delays and administrative complexities, governments can help offset and correct this negative perception by addressing their digital transitions efficiently and cost-effectively, by focusing on improving the speed and quality of their functions, and by using their IT systems to offer new, innovative services to their citizens. Again, open source can be a valuable asset in this regard. Indeed, it is relatively easy to combine several open-source components to create new software. In addition, because the code is open, anyone who has a good idea can easily prototype it and test it quickly. Thus, by developing an internal IT culture built around open-source software, public service IT teams can enhance their skills, improve their systems, and better serve the public. Indeed, many are already doing this, as the emergence of numerous open data initiatives and APIs from public bodies published in open source demonstrates.